Timothy Two Project, International exists to serve a critical need around the world. We are committed to equipping and training indigenous pastors and ministry leaders with the essential truths of the Christian faith so that they can train others. This way, the mandate from Christ in the Great Commission to “make disciples” can be accomplished in areas of the world where there is little or no formal biblical and theological training available. Independence, Belize. Seven pastors and ministry leaders representing four local churches completed the fourth and final workshop this week and received Certificates in Biblical and Theological Foundations from Timothy Two Project International. Pastor Leonel De La Rosa of Bella Vista, Abraham Ac of Medina Bank, and Pastor Epifanio Chun, Jr., Erla Paquiul, Thelma V. Peters, Mary Pearl Rivas and Steve Kohl of Independence have completed the “Growing in Grace” series of workshops. In this series, they studied and discussed the Biblical doctrines of God, man, Christ, the Holy Spirit, and salvation. In addition, they investigated the Bible’s teachings in practical theology concerning relationships, social issues and personal issues as well as service to God in the church, the community and the world. They are now equipped to teach these workshops to others within their churches, communities and surrounding regions. In addition to teaching these workshops in their own churches, Pastor Chun, Jr. hopes to teach ministry leaders in more southern parts of Belize, and Pastor De La Rosa hopes to teach other pastors in neighboring Guatemala, Honduras and Nicaragua. This series of workshops was taught by Timothy Two Instructor and Latin America Regional Director, Rev. Dan Sonnenberg, was coordinated by missionary Steve Kohl and held at Global Outreach Mission’s Dental Clinic. Dan will be teaching Workshop 4 in Independence, BELIZE February 11-16 with the group in the first photo coordinated by Steve Kohl. Dan will be teaching Workshop 1 in Las Tunas, CUBA March 18-23 with a new group of pastors in a new city coordinated by Leo and Esdras in the second photo. Please keep him in your prayers. Support his work in 11 cities in 9 Latin American countries http://bit.ly/2LvuTby. Dan and Beth with coordinators Leo and Esdras in Havana, CUBA. What is a “National Missionary Partner” and what do they do? A Timothy Two “National Missionary Partner” is an indigenous pastor in Asia, Africa or Latin America who has completed the series of four Timothy Two workshops and who is then sent to other towns and cities in his own country to teach those workshops to other groups of pastors. We call them “national” missionaries because they serve among their own people. By contrast, others of us would be referred to as “international” missionaries because we serve in many countries throughout a particular region. We call these pastors missionary “partners” because they extend our ability to reach other pastors within each country. They have contacts in other regions, cities and towns who also need these workshops. are able to use local means of transportation instead of flying ; 2) there is no need or expense for an interpreter because they already speak the local language; and, 3) they are already familiar with the people and their culture so that the teaching is properly contextualized. Several countries have a separate fund on our website to support the work of a National Missionary Partner in that nation. As you scroll through and click on each country in the list of over 40 nations on our newly updated website, you will see that some already have the picture of a National Missionary Partner. For example, on the Cuba page, you will see a picture of Pastor Leo and Esdras. To support their work throughout Cuba, you would click on the pink Donate button and fill out the form. Thus, you can virtually “adopt” a nation to financially support the work of a National Missionary Partner there. (As a reference, each workshop taught by a Partner costs approximately $300-$500 U.S.) We thank God for these Partners who are coming alongside us, and who are willing to put in the extra time and effort to train fellow pastors with the fundamentals of the faith among their own people. Lima, Peru. A testimonial from local pastor, church planter and Timothy Two workshop coordinator, Reynaldo Rubio. It’s the first days of September 2018. Our teacher of the Timothy Two workshop, Dan Sonnenberg, is teaching the third workshop for leadership in the Republic of Peru. Thank God for the ministry Timothy Two. We continue with the time of biblical and theological training for several pastors and leaders of Pamplona and Lima South. The theme of this third workshop is practicing the life of the kingdom: family, church, the world, government, divorce, homosexuality, abortion, work, money, votes, fear, disease, pain, suicide and death. It’s the third workshop of four seasons of training. We thank Timothy Two for its willingness to contribute to us. It will be a time of much blessing. Being located in a seismic area, Peru is being constantly whipped by earthquakes. In addition to earthquakes, Peruvians also suffer from a large amount of floods, landslides and droughts. All these natural disasters have different ways of impacting the people of the country. With the environment of Peru altered by nature, agriculture can be slow as a result, therefore damaging the country’s economy and the food security of people. The damage that natural disasters leave on houses and cities also tend to damage the economy, as more money is needed for repairs. In Peru, there is a wall that divides the rich and poor of the country, literally. The Capital of Lima is divided into two parts: the poor and the rich. The rich are so serious about keeping their side inhabited by the rich who require them to show an id card to get in. According to Business Insider, a wealth gap between rich and poor is not beneficial to the economy. With an extreme division like there is in Lima, the poor will probably remain poor as people who could help them are practically imprisoned. Peruvian women earn 30 percent less than men in the workplace. They are also subject to sexual violence and murder. In an attempt to achieve equality, women have participated in marches to defend their rights. If women are better treated and more opportunities are provided, they will have more to offer economically and essentially they will be able to provide for them and their families to a greater extent. Despite all these causes of poverty in Peru, some progress has been made. Overall poverty in the country decreased 1.1 percent from 2015 to 2016. Fortunately, Peru will continue to address poverty and eliminate some of the causes. God has blessed me with the opportunity to teach women and men how to work more effectively with their children in Latin America. Though much of this region is more advanced than some other parts of the world, they are still very much influenced by old world Catholicism in their ways and its views of Christianity. Many of the Latin American countries teach their children in a traditional manner, that is, with the teacher telling a story and the children sitting and listening. In our workshop for children’s ministry leaders, we introduce the concept of active learning and train participants to involve the children in the learning process using activities, puppets, play acting, music and games which involve all three learning styles. We also teach tried and true methods of lovingly disciplining children so their classes can be run more effectively. Introducing them to the concept of team-teaching also helps encourage potential new teachers and makes teaching easier by sharing the load. Haiti has a mix of voodoo and ancestor worship that taints their Christianity. We are pleased to bring solid theology to the churches there. The first Timothy Two workshop for pastors and ministry leaders, “Knowing God,” is used to create a curriculum for children. As teachers and children study the attributes of God they can know Him and worship Him more fully. Helping teachers learn to study God’s word, showing them what materials are available to help in their teaching, giving them information about how children can be taught more effectively at a young age and modelling new teaching styles brings excitement to a task often viewed as challenging to many adults. I have had the privilege of ministering to teachers in Havana and Palmira, Cuba; Lima, Peru; and, Jacmel, Haiti so far. We also have invitations to teach in new locations in Haiti, Colombia, Dominican Republic, Ecuador, Argentina and Brazil. It brings me great joy to teach children’s ministry leaders who desire to learn and to see the joy in their faces as they learn that teaching children can be a positive, exciting and rewarding experience which can produce much fruit. What a privilege to teach people who desire to learn and improve their skills. Many of the places we go have very limited resources and it is often overwhelming to see the needs there. I find comfort in knowing that you with your support and Dan and I in our service can help influence and educate God’s precious people in Latin America. Many often feel forgotten by God because of their neediness. When you send missionaries you show that God has not forgotten them and that you care about them. We may not be able to give them a lot of money but we can share what we have learned. That makes a world of difference to those we visit. You care, we care and most importantly GOD cares. Our prayer for each of the countries we visit is that they will use these teaching skills to reach out into their communities and bring in the harvest that is all around them. Thank you so much for your part in what we do. We can’t go without your prayers and support! Ressources françaises des Ministères du Troisième Millénaire. French Resources from Third Millenium Ministries. Nous sommes heureux de vous présenter ces traductions françaises de notre matériel réalisées grâce à notre partenariat avec Huguenot Heritage. Spanish Resources from Third Millennium Ministries. Cursos a nivel de seminario en español de Ministerio Tercer Milenio en video, audio y manuscrito. Seminary level resources in Spanish in video, audio and manuscript form. Las lecciones de seminario de Ministerio Tercer Milenio están disponibles en línea en los formatos de video, audio y texto. Las lecciones son completamente gratuitas para ser descargadas y para verse en línea. Las lecciones descargables pueden ser copiadas gratuitamente y distribuidas. Los DVDs también están disponibles. El Ministerio Tercer Milenio también ofrece clases en línea para ser usadas por estudiantes, maestros e instituciones. Our Mission: To train local pastors and church leaders in developing nations in the essential doctrines of the faith and to equip them to train others. Our Vision: To see the global church of Jesus Christ equipped for the effective ministry of the gospel throughout the world, irrespective of geographical, cultural, financial or political challenges. Our Curriculum: Timothy Two Curriculum: Growing in Grace Series Table of Contents lists the theological topics we teach in the four workshops. Financial Accountability: Timothy Two is an evangelical, Reformed ministry, organized as a 501 (c) (3) tax-exempt, non-profit missions organization, accredited by the Evangelical Council for Financial Accountability (ECFA). We teach the fundamentals of the faith to pastors and ministry leaders in over 35 countries around the world who do not have access to seminary training due to their location, work or finances so that they can teach others and thus strengthen the Church. God’s Attributes (Theology Proper). God is Trinity, self-existent, infinite, eternal, unchanging, self-sufficient, all-powerful, all-knowing, all-present, great, sovereign, all-wise, good, loving, gracious, jealous, just, true and holy. Salvation (Anthropology, Christology, Soteriology, Pneumatology). What is man, sin, depravity? Who is Jesus: the God-man, his state of humiliation, his state of exaltation, as Prophet, as Priest, as King? What is election, salvation, regeneration, faith, repentance, atonement, redemption, justification, adoption, baptism of the Spirit, sanctification, perseverance and glorification? Practicing Kingdom Living in Relationships, Social Issues and Personal Issues (Practical Theology 1). What does the Bible say about husbands, wives, fathers, mothers, children, friends, church, the world, government/authority, divorce, sexual sin, homosexuality, abortion, work, money, oaths and vows, fear, sickness, grief, suicide and death? Serving God in the Church, Community and World (Practical Theology 2). Serving God as pastor, elder, deacon, teacher, in cell groups, men’s ministries, women’s ministries, youth ministries, children’s ministries, through worship, hospitality, giving, by meeting material needs of others, promoting justice, working unto the Lord, living as “salt and light,” through prayer, through humility, by sending missionaries, by going as missionaries, discerning your call to serve. Report on my second trip to train pastors and Beth’s first trip to train children’s ministry leaders in Peru, and my upcoming trip to Haiti. Read about my second and third workshops in Belize. Jared Moore has assembled a list of the current top 50 orthodox evangelical Christian blogs that often interact with popular culture. For free eBooks on this topic by A.W. Pink, John Owen, Charles Hodge, Martin Luther and more click here. “The New City Catechism” is a modern-day resource aimed at helping children and adults alike learn the core doctrines of the Christian faith via 52 questions and answers. Below is an excerpt. It is available in Book, Web App and Mobile App form. Each question also includes a Scripture, a Prayer and a Commentary for weekly devotional use. Questions and answers are adapted from various historic catechisms. Christ Our Hope, in life and in death, we cast ourselves on your merciful, fatherly care. You love us because we are your own. We have no good apart from you, and we could ask for no greater gift than to belong to you. Amen. If we, then, are not our own but the Lord’s, it is clear what error we must flee, and whither we must direct all the acts of our life. We are not our own: let not our reason nor our will, therefore, sway our plans and deeds. We are not our own: let us therefore not set it as our goal to seek what is expedient for us. . . . We are not our own: in so far as we can, let us forget ourselves and all that is ours. Conversely, we are God’s: let us therefore live for him and die for him. We are God’s: let his wisdom and will therefore rule all our actions. We are God’s: let all the parts of our life accordingly strive toward him as our only lawful goal. O, how much has that man profited who, having been taught that he is not his own, has taken away dominion and rule from his own reason that he may yield it to God! For, as consulting our self-interest is the pestilence that most effectively leads to our destruction, so the sole haven of salvation is to be wise in nothing and to will nothing through ourselves but to follow the leading of the Lord alone. At one point in his writings John Calvin lays out the essence of what it means to live the Christian life. He says that he could make us a list of the commandments we should be keeping or a list of all the character traits we should be exhibiting. But instead, he wants to boil it down to the basic motive and the basic principle of what it means to live the Christian life. We are told that in our area of southeastern North Carolina, we will be able to experience 96.4% of the total eclipse today (Monday, August 21). The opening verses of Psalm 19 remind us that the majesty of the heavens declare, with nary a word, the glory of their Creator, not only to some, but to all. Is God a Beneficent Provider or Cruel Oppressor? Augustine, bishop of Hippo Regius, Numidia in north Africa (354-430 AD) , On Christian Doctrine, Book 1, Chapter 14. “There are at least three commitments that every church should make. Philip Graham Ryken, City On a Hill: Reclaiming the Biblical Pattern for the Church in the 21st Century (2003) Moody Publishers 141-145. C.S. Lewis, Mere Christianity (1952) Barbour and Company 168-169. Clines, Tynbul 19 (1968) 103 in Victor P. Hamilton, The Book of Genesis Chapters 1-17 (1990) Eerdmans 147. A Position Paper expresses the mind of the General Assembly of the Evangelical Presbyterian Church on a subject of compelling interest. It is a definitive but not an exhaustive statement. A Position Paper is not to be regarded as binding on the conscience of churches or individuals. Pastors and ministry leaders in Havana, Cuba completed Timothy Two Project International’s Workshop 4, “Serving God: Living Life in Response to Grace” in which we studied and discussed what the Bible teaches about serving God in the church, the community and the world. Having also completed three previous workshops in our “Growing in Grace” series earlier this year, they each received a Certificate in Biblical and Theological Foundations. On this trip, my wife, Beth, accompanied me for the first time to teach classes for children’s ministry leaders and music ministry leaders. She is pictured below with her students and some of their children. See my full report (with more photos) on our teaching trip to Cuba during June 2017. These Cuban pastors and ministry leaders recently completed Timothy Two Project International’s Workshop 3, “Trusting God: Practicing Kingdom Living” in which they studied and discussed what the Bible teaches about trusting God in relationships, social issues and personal issues. See my full report (including more photos and videos) after this teaching trip to Cuba during May 2017. These Cuban pastors and ministry leaders recently completed Timothy Two Project International’s Workshop 2, “Loving God: Transformed from Darkness to Light” in which we studied and discussed the work of Christ to accomplish salvation and the work of the Holy Spirit to apply salvation in the lives of believers (Christology, pneumatology, soteriology). And I was thrilled to hear that several participants had already begun teaching the material from Workshop 1 to the next generation of students in their churches and neighborhoods. Watch the videos below to hear their stories. 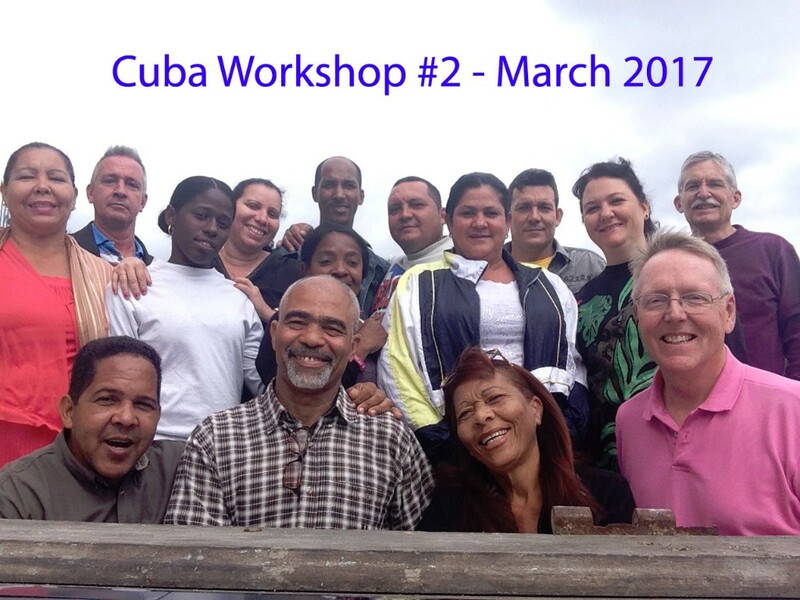 We asked the coordinating pastors to share their vision for the work of Timothy Two in Cuba. The pre-revolution National Capitol Building can be seen in the background. Here is their story. See and hear the sights and sounds of a street corner in Old Havana. Listen to congregational singing at a Cuban house church. This group is highly motivated to complete the training. We have been invited to return as soon as possible to teach Workshops 3 and 4 before the beginning of hurricane season in the Caribbean. I am scheduled to teach Workshop 3 the week of April 30 – May 5. We recently made our first trip to Havana, Cuba to equip a group of 10 pastors and ministry leaders by teaching and discussing Timothy Two Project International’s Workshop 1, “Knowing God” concerning the attributes and works of God (theology proper). These students from various denominations and various cities and towns throughout the region, are now prepared to teach these 21 lessons to those in their local churches and communities using the biblical content we provided, as well as culturally relevant illustrations and study questions they developed in group discussions together with one another throughout the week. Timothy Two instructors equip pastors in the majority world who do not have access to formal theological training. And we do so, not using a lecturer-listener format, but in a small group teaching-and-discussion format. This not only trains pastors in systematic and practical theology, but also equips them to train others. Watch participant testimonials. Watch a video filmed while walking the streets of Havana in the morning. See a video of congregational and small group singing in Cuba. See my full report on this trip. The ministry of Timothy Two Project International began in 2011 in the hearts of a group of elders and leaders from Myrtle Grove Presbyterian Church in Wilmington, NC. I began working with Timothy Two in March of this year when I interned in Vietnam (fig. 1) with Steve Curtis, International Director, by observing him as he taught the group. I recently taught a workshop in two developing nations entitled, “Knowing God” which is the first of four in Timothy Two Project International’s Growing in Grace series for indigenous pastors and ministry leaders. Small group discussion is one of the priorities of our teaching method. During each of the twenty-one lessons in the workshops, we take time to discuss participants’ questions and to develop culturally relevant illustrations and responses for each topic. Below is a sampling of the many questions raised by participants under the various topics during these two workshops. Note that some questions do not necessarily pertain to the particular topic, but apparently came to mind during that discussion. My purpose in this article is not to to answer or debate the stated questions, but to illustrate for the reader the need for biblical and theological training among ministry leaders in developing nations whose access to such training is severely limited by distance and/or finances. This is the need that the ministry of Timothy Two seeks to meet. More info at TimothyTwo.org. Can we know about God also by the image of God in us? How do we explain that we won’t get old in eternity? Did those who went to heaven without dying (Elijah/Enoch) do so because they were sinless? Did Christ have to die for them? What is the biblical evidence that people gained immortality? Would it be more correct to say that God exists or subsists in three persons? Did people speak of God as Father, Son and Holy Spirit in the OT (Old Testament)? Are the three persons of the Trinity sometimes one person or always three? Some people say Jesus is not God, why? Referring to the verse “no man can come to the Father except through me” seems to prove that Jesus is not God. Does it? In Acts 2 it says the Holy Spirit is a power, and if a power, can we pray to the Spirit as we pray to the Father and the Son? Prove this in the Bible. Compare angels to the Holy Spirit. Where does the Scripture say that we should worship the Holy Spirit as God? May I pray to the Holy Spirit? Are the three persons of the Trinity the same or different, and does God work as the Holy Spirit sometimes, as Jesus other times? Eight pastors and leaders of three local churches gathered together with me and several translators in Barbosa, Antioquia, Colombia for four days last week to study and discuss the attributes of God. Click here to read my full report including more participants’ comments about the workshop, photos and videos, and my visit to the Latin American Reformed Seminary in Medellin. For more information about Timothy Two Project International, click here. Equipping pastors and ministry leaders in developing nations who have little or no access to Biblical and theological training – so that they might teach others also. Ten young pastors and ministry leaders, including two translators, gathered together with me for four days in Jacmel, Haiti to study and discuss the attributes of God. Click here to read my full report, see photos of the group and watch video testimonials of two participants of this workshop. To learn more about the ministry of Timothy Two Project International, click here. Click here to see the details of my upcoming trips with Timothy Two Project International to equip pastors who have little or no access to theological training in the Caribbean and Latin America.